Whether there are more risks in soy amino acids than benefits depends on your vantage point. Some people regard soy as a "superfood," while others say it's dangerous. Healthy adults have fewer reasons to worry about soy than children, pregnant women and people with illnesses. If you have any doubts about soy, consult your physician about whether to include it in your diet. There's a risk the body may not absorb amino acids from soy as efficiently as other types of protein, especially carnivorous sources. Bodybuilders in particular are concerned with whether protein supplements from different sources of protein promote muscle creation more than others. Protein supplements are usually made from egg, whey, a byproduct of milk, or soy, which comes from the soybean plant. Among weightlifters, plants have a reputation for being weaker than animals in terms of how readily muscles absorb protein. The reality is that no one source of protein consistently proves to be better than the others. Some research indicates egg is best, while other studies have shown whey works best, and other statistics favor soy. Even though the data is inconclusive, there is, nonetheless, some risk inherent in the fact that consumers and scientists alike continue to question whether soy is the best source of amino acids. While soy's benefit to muscle growth is debatable, growing children are another matter. Soy additives have wended their way into mainstream foods to bolster protein content of fast-food hamburgers and baby formula. This has been called a contributor to the earlier onset of puberty among today's youth, although the phenomenon may have more to do with growth-stimulating hormones fed to cows and other livestock. Regardless, as long as scientists are still learning the risks of soy amino acids, it's probably a good idea to limit children's consumption of foods containing soy. Pregnant women would do well to follow the same advice, or better yet, consult with their physicians about diets while expecting. Unless you consume soy products made from organic ingredients, there's a high risk of ingesting toxins, namely pesticide residues. This risk is more pronounced for processed soy products, where soy is an ingredient, rather than nonorganic soybeans themselves. Tofu, tempeh and other processed soy products have more concentrated amounts of the plant and therefore contain greater concentrations of any chemicals contained in the plant. 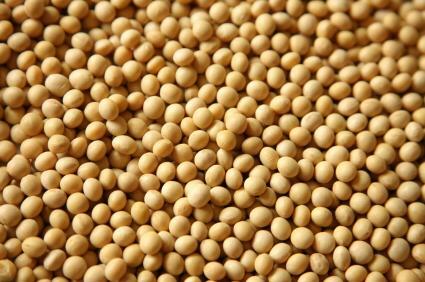 Soy puts extra strain on the digestive tract because of the added work to process fibrous plant materials. That extra effort isn't deleterious if you're in good health. A related, and much more realistic concern, is the very real likelihood of increased flatulence resulting from the addition of legumes to the diet. Consider that a tradeoff, and if it bothers you, invest in some Beano to reduce gas. Certain prescription drugs don't mix well with soy, and the labels contain warnings to that effect. Soy can interfere with respiratory medications, like Primatene and Atrovent. Treatments for high blood pressure, like Warfarin, also warn against soy consumption. The same goes for medications for thyroid conditions and estrogen supplements. Die-hard carnivores would lead you to believe there's a risk of boredom in getting amino acids from soy. Tofu in particular has a reputation for having no taste, and some might say the same about soybeans and tempeh. That's essentially true if you don't add any flavoring to the tofu or other product based on soy. However, the lack of any native flavor makes it very easy to season tofu just about any way imaginable. That includes meat flavoring, and using real meat to achieve that taste has the added benefit of promoting more efficient uptake of protein. Whether your concerns have to do with prescription drug interactions or maximizing protein absorption, it's a good idea to ask your doctor for advice on your diet. A professional will know best whether you need to heed risks of soy amino acids.